Aleve is a non-prescription pain reliever. It contains the medication naproxen, which belongs to a category of drugs known as nonsteroidal anti-inflammatory drugs (NSAIDs). It works by preventing the body from producing certain natural substances (prostaglandins) that result in inflammation. By blocking the production of these substances, this helps to reduce pain, fever and/or swelling. Aleve can provide temporary relief from minor aches and pains that might result from various conditions. Examples of these conditions may be muscle aches, headache, menstrual cramps, dental pain, or arthritis. It may also be used to treat minor aches and pains or reduce fever related to the flu or common cold. 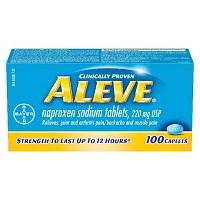 It should be noted that Aleve is an over-the-counter (OTC) pain reliever and is not the same as the prescription drug Naprosyn. While both contain naproxen, Naprosyn contains more of the drug in its pills. Due to this fact, it is available only with a doctor’s prescription. Naprosyn is meant for treating acute pain, chronic (ongoing) pain and inflammatory conditions. Prior to taking Aleve, be sure to read the full label and product instructions to make sure you are familiar with the ingredients, the dosage instructions and potential side effects. Follow the dosage instructions carefully or take this medication as directed by your healthcare provider. The most common side effects associated with Aleve include upset stomach, heartburn, nausea, drowsiness, headache, or dizziness. This medication may also raise your blood pressure. If you are taking Aleve for several days, monitor your blood pressure regularly and tell your doctor if your results are high. Although rare, it is possible to experience serious side effects when taking Aleve, including liver damage (symptoms include: dark urine, loss of appetite, persistent nausea/vomiting, stomach/abdominal pain, yellowing of skin/eyes) and severe allergic reaction. If either of these occur, seek medical help immediately. If after taking this medication your condition persists or worsens, side effects persist or worse, or if you think or are worried that you may have a serious medical problem, talk to your doctor right away. Most healthy adults can take Aleve without any issues. However, it may not be an ideal choice for everyone. If you are pregnant or nursing, consult with your doctor before taking this medication. Likewise, if you have an existing medical condition or are currently taking other medications or herbs, find out from your doctor if taking Aleve is a safe option for you.